163. How much memory does my Mac have? Can I get more? How much do I need? 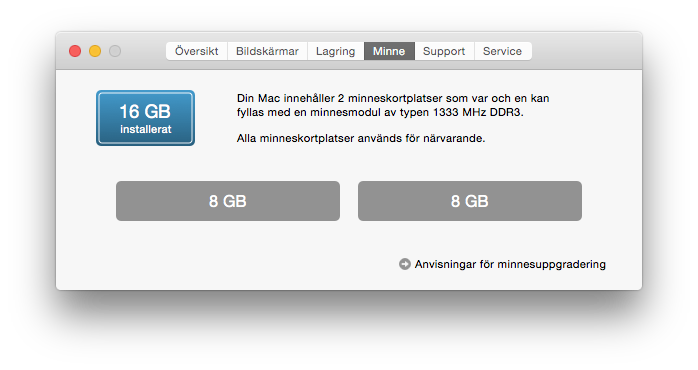 Go to the Apple menu and go to About this computer or Om den här datorn. Check Memory in GB too see what is currently have. 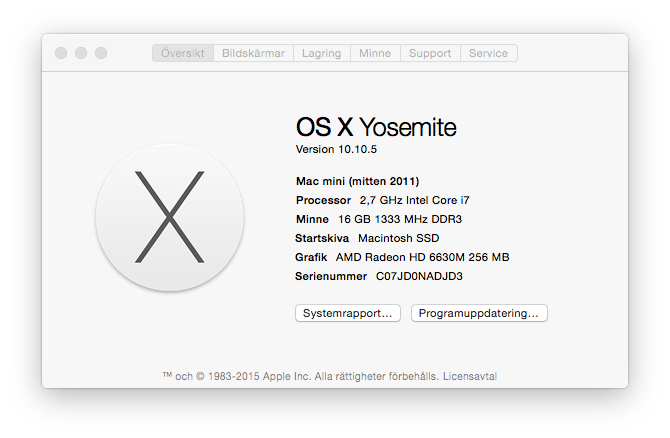 Example with macOS Yosemite and 16 GB. Your contact information (phone number) unless it is in the university catalogue. At EveryMac you can also see the highest version of the operating system that is possible to run. As Local IT: Buy memory via produktwebben. Please note, this is done by the Local IT. Do not do this unless you really know what you are doing. And then you are on your own if the memory do not fit or something else goes wrong. As Local IT: Install memory on the Mac. Change the order of the memory physically. This may just clean the oxide from the connectors. Remove the memory modules, one at a time, and run the computer with the remaining memory to see of this solves the problem. Replace the faulty memory module.